For those who love a sudoku puzzle, Everyday Sudoku has a great selection with varying degrees of difficulty. 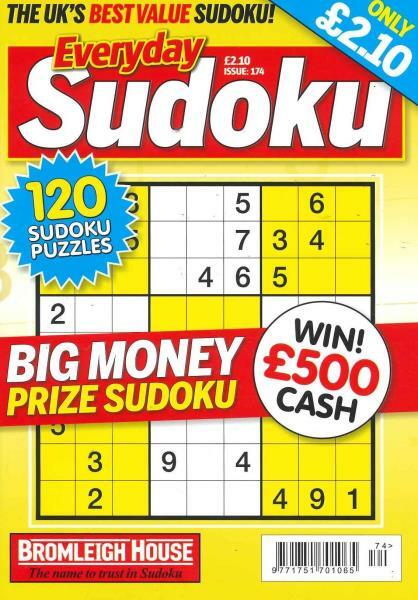 Buy a single copy or subscription to Everyday Sudoku magazine. Everyday Sudoku has a unique calendar format which provides different puzzles for every day of the week so each day there are a selection of “coffee break quickies” as well as more challenging grids for the journey to work or the evening. Good magazine. Every puzzle is solvable and the puzzles don't get harder as you go through. They might get trickier but they are always a pleasure to do. I like this particular book because it is clear and offers a good range of difficulty. Also the paper used is good quality unlike some that are poor.